This is Tinhorn Creek Vineyards fifteenth anniversary. In several ways it has been a momentous anniversary. To begin with, this year’s releases from the winery – the whites in the spring and the reds this fall – have been among the best ever from Tinhorn Creek. The releases also included the first new varietal from the winery since its launch: a fine Syrah has joined its portfolio. As well, the winery committed itself this summer to becoming one of Canada’s first (possibly the first) winery to be carbon neutral. That involves capping the carbon emissions from winery operations and then beginning to reduce its production of greenhouse gases. The first steps down that road are such common sense measures as replacing overhead sprinklers with drip irrigation; that reduces the winery’s energy consumption, to say nothing of conserving water resources. In addition, the vineyard tractors have been switched to using biodiesel fuel. There is a delicious irony that Tinhorn Creek, of all wineries, should be leading the pack toward carbon neutral. 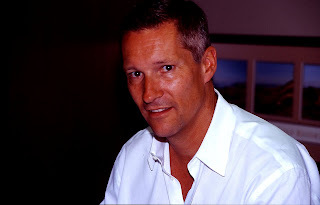 The winery’s major owner, Robert Shaunessy, is an Alberta oil executive. He is obviously one oilman who is on side with the struggle to contain global warming. In the immediate term, what matters to consumers is that of Tinhorn Creek’s wines are strong – and reasonably priced. Even the reserve wines, called Oldfield Series, are much less aggressively priced that most reserve wines from the Okanagan. Oldfield refers to winemaker Sandra Oldfield and husband Kenn, whose focus is on the vineyards. 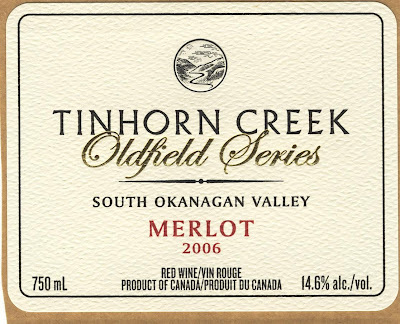 Tinhorn Creek Oldfield Series Merlot 2006 ($28), with 1,551 cases released, has been tweaked for this vintage with the addition of 6% Cabernet Franc and 1% Syrah. The wine also spent 18 months in barrel (French and American) and one year in bottle before release. It is ready to drink now but can also be cellared at least five more years. This is a rich and well-balanced wine with spicy berry aromas and with flavours of blackberry, cherry and plum. I saved half a bottle for next day and found that the core of sweet fruit flavours had become even more generous and appealing. 90-92. 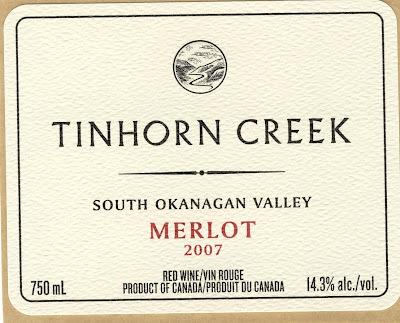 Tinhorn Creek Merlot 2007 ($19) should be widely available because the winery released 10,442 cases. For obscure reasons, I found myself tasting and re-tasting this wine over five days and I swear that it was better on each succeeding day. It is a sturdy red, tasting of black currants, cherries, vanilla and dark chocolate. The tannins were a touch bitter on the first day but they softened right out, as one would expect. Do yourself and the wine a favour by decanting it. My score started at 87 on the first day and climbed to 90 by the fifth. 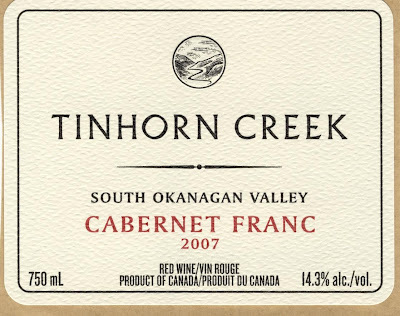 Tinhorn Creek Cabernet Franc 2007 ($18). On first impression, this is a rustic, earthy and spicy example of Cabernet Franc, with concentrated fruit and flavours of plums and currants – and the expected zesty lift of this varietal. This is another one to decant and let the fruit emerge. My point score improved over three days of tasting to settle at 88. The winery released 6,444 cases. This fall’s release also include the winery’s Kerner Late Harvest 2008 ($13 for a half bottle). That sample has been set aside for a sweet wine tasting. Previous examples have been appealing, as is this price. With the latest release here of a new [yellow tail] ® wine, Casella Wines of Australia shows how to handle the labelling of wines with juice from different countries. The way? Openly. Perhaps this is a lesson for how our big wineries should resolve the Cellared in Canada controversy. The new [yellow tail] Sauvignon Blanc, a non vintage wine just listed here at $12.99 a bottle, is made with 86 per cent South Australian and 14% New Zealand juice. It says so right on the back label. It is a pretty successful blend. The comparatively ripe Sauvignon Blanc from Australia likely accounts for the wine’s lush tropical fruit flavours. The New Zealand portion adds the zing (acidity and crispness) to the aroma and the fresh flavours. The wine might use a hair more concentration but that is really a picky point. Like all [yellow tail] wines, this is easy to drink on its own or with food. At $12.99, it is quite good value. I scored it 87 points. In a press release, winery owner John Casella said that the company could have released a [yellow tail] Sauvignon Blanc years ago but “we were never really happy with the quality” until they hit on the idea of a two-country blend. Sadly, the release of the wine coincided with the news that John’s father and the winery founder, Filippo, had died at 88. A third-generation grape grower and winemaker from Sicily, he immigrated to Australia in 1957 and established a vineyard two years later. He started the Casella winery in 1964. It sold its wine in bulk for many years. John took over the business in 1994. Filippo and his wife continued to live on the property even after a huge tank farm grew up around their home with the enormous success of [yellow tail]. The label was launched in 2001 when John Soutter, the company’s former exporter director, bought the label from a label broker in a deal made on the fly in Sydney airport. Since then, [yellow tail] has taken many markets by storm. In some markets, [yellow tail] has dominated the Australian category almost to the exclusion of other brands. Why does the brand succeed? Taste this Sauvignon Blanc. The wines deliver good quality for the price point and do it consistently. There is only one thing to say to the misguided self-declared consumer of “anything but Chardonnay” – that leaves more for those who know better. The aversion to Chardonnay goes back a decade or so when there were too many over-oaked Chardonnays on the market, especially from Australia. In recent years some producers have gone to the other extreme by offering unoaked Chardonnays. That often reduces a great white wine to a cocktail party beverage, although there are exceptions. The great Chardonnays are almost always made and/or aged in barrels, but not excessively. 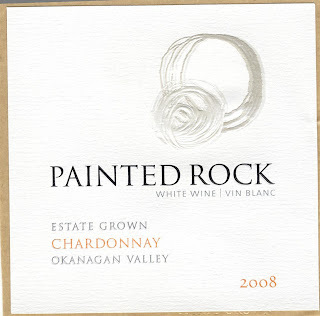 And many British Columbia wineries are now dialling in such great Chardonnays. A great Chardonnay is a wine where the aromas and flavours of the fruit are paramount; but the potential complexity of the variety is enhanced by fermentation techniques (a touch of wild ferment, sometimes) and by subtle use of oak. Barrel-fermented Chardonnay integrates the oak much better than a wine that is merely barrel-aged. There may be a touch of malolactic fermentation which, in addition to softening the acidity, imparts richness to the flavour that recalls butter. By letting only a portion of the wine in the blend to go through ML, some winemakers preserve acidity that gives the wine a bright, crisp finish. The structure of the wine enables great Chardonnay to age in the bottle at least five years. In short, there are many steps involved in growing and making great Chardonnay. This is the reason why the wines are unlikely to be cheap (but bargains can be found). I have gone through my tasting notes for this season to highlight some examples. Since I have not tasted every Chardonnay, there will be some omissions. Please add your discoveries in the comment section at the bottom of this blog. Quails’ Gate Stewart Family Reserve 2007 Chardonnay ($30). The wine begins with appealing aromas of citrus framed by the delicate toastiness that comes from barrel fermentation in good French oak. It is a surprise that the wine completed full malolactic fermentation because it still presents lively, tangy acidity, giving the wine a refreshingly crisp finish. On the palate, the wine is rich, with abundant flavours of lemon and lime and subtle spice, likely from the barrels. 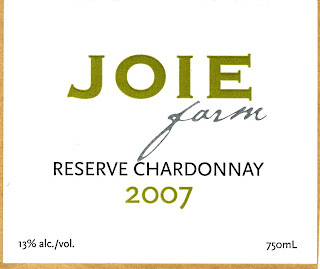 This Chardonnay will develop additional character with a year or two of cellaring if you can keep your hands off it. 90-92. In an inspired piece of marketing last February, Laughing Stock Vineyards owners David and Cynthia Enns pegged the price (in part) of the winery’s flagship Portfolio blend to the stock market index when offering the wine for future delivery. The Toronto index then stood about 9000. It had been as low as 7,600 in the earlier market crash and there was no assurance of recovery in the near term. Well, you know what happened to the market. The index currently is around 10,500. There are no rebates going out to those who paid for their orders in February. Portfolio 2007 has now been released with a retail price of $40. Those who took a chance in February at $35 are not complaining, since they already got the wine at a reasonable discount. In any event, their mutual fund statements are so much healthier these days that they can think about buying wine again. Whether you bought futures or are paying full price, you are getting a wine worth every penny being asked for it. Many of those ordering futures had taken the option of directing rebate cheques, if any, to charity. Even though there are no rebate cheques, David and Cynthia, on their own initiative, have sent the amount that would have been rebated – had the market tanked – to the capital campaign for the Naramata Centre. It seems to me that everyone has come out a winner. The vintage in 2007 turned out to be quite good in the Okanagan even after a rainy three weeks in September (very unusual) caused much concern. But when the sun came out again, the weather stayed fine to the end of October. The Bordeaux varieties had lots of time to ripen and develop great flavour. Laughing Stock produced 2,750 cases of Portfolio 2007. The wine is a blend of 56% Merlot, 25% Cabernet Sauvignon, 12% Cabernet Franc, 6% Malbec and 1% Petit Verdot. You might ask why bother with just one per cent of Petit Verdot. The answer is that the variety adds an important hint of spice to the aroma and flavour. Any winery making a Bordeaux blend will use all five varieties if they are available. This wine spent 19 months in French oak barrels, 60% one year old, 40% new, a mix that prevents the oak flavours from overwhelming the wine. This is a bold wine. It is drinking well now but it has the structure to develop well for the next seven to 10 years. In the past year, several important changes have occurred at Naramata’s Therapy Vineyards. First, a new winemaker, Steve Latchford (above), took over last November when Marcus Ansems left to run a wine importing club. Secondly, Therapy completed a new winery about four times the size of jam-packed previous winery. This gives Therapy, which is making about 10,000 cases annually now, the capacity to grow to 15,000 cases. Thirdly, the winery’s latest releases include a wine – its first Malbec – with a label that has nothing to do with psychoanalysis theme that Therapy explores on most of its labels. Artists were asked to submit label ideas on a winter sports theme. The winning art shows hockey players, in what may well be the first time, surprisingly, that there has ever been a hockey figure on a Canadian wine label (excluding private labels). Therapy was launched in 2005 by an investment group led until 18 months ago by an Alberta businessman, a leading member of the Opimian Society. A nasty fallout among the investors in the summer of 2008 led to a management restructuring. Judging from recent tastings of Therapy’s wines, whatever was happening at the front of the house caused no damage in the cellars. The wines, made by Marcus and finished by Steve, remain solid. Steve was born in 1982 new Prince Edward County in Ontario and worked at a dairy farm before enrolling in the winemaking program at Niagara College in 2001 – before he was old enough to drink legally. Graduating in 2004, he joined the Jackson-Triggs winery in Ontario and worked in a number of the Vincor vineyards there. Therapy recruited him during the 2008 vintage. “Everything was a nice fit for me here,” Steve says. Indeed, what winemaker would not want to a place with a good reputation and a new winery? There was not a lot of room for expansion at Therapy’s compact site. The previous owners of this site, when it was the original Red Rooster Winery, simply moved to a much larger property on Naramata Road. Therapy’s owners found room for the new 7,500 square foot winery by removing a block of underperforming Merlot vines. The tasting room, while remaining in the previous building, has also been enlarged. The winery’s barrel cellar – there currently are 450 barrels here - is dug into the hillside, a design that harnesses the earth to insulate the building. The tank cellar has high ceilings to accommodate slender tanks. And there is a top floor for a spartan set of offices. In sum, a functional winery. The latest releases include three reds from 2008. Here are notes on those and other recently tasted Therapy wines. Mission Hill Family Estate’s ultra-premium family of wines is now a quartet with the release this week of Compendium, a new blend of the Bordeaux red varieties. At $40 a bottle, this is the wine to buy if your budget does not stretch to the $70 asked for Oculus, the winery’s signature red. Compendium is one of three wines in what Mission Hill calls its Legacy Series. The others, first released last year, are Quatrain, a red built around Syrah, and Perpetua, an elegant Chardonnay. And there are more high-end wines to come. Last month I tasted a very impressive tank sample of a 2008 dry Riesling. The working title of this unreleased wine is Fritz Riesling because Fritz Hasselbach, the proprietor of German’s Weingut Gunderloch, has been involved since 2006 as a consultant and blender on Mission Hill’s Rieslings. A veteran of 30 vintages in Germany, Gunderloch is a leader in the Riesling Renaissance and a worthwhile addition to the Mission Hill brains trust. The so-called Fritz Riesling will take its place at the front rank of Canadian Rieslings – a tangy, concentrated and savoury wine. I scored the sample 90-92. While Mission Hill winemaking team, led by John Simes, is superb, it never hurts to tap the skills and the ideas of a few outsiders. That became evident a few years ago when Michel Rolland, the French super-consultant, became involved in the production of Oculus. He doesn’t make the wine, of course. On his advice, Mission Hill added a number of sophisticated pieces of wine-making equipment. He also comes around to help Mission Hill’s team put together the blend for Oculus. Mission Hill began making Oculus in the 1997 vintage. The last four vintages of Oculus have seen the wine move to a higher level. It may have been the influence of Rolland coupled with the impact of maturing vineyards. This wine aspires to a First Growth of the Okanagan. Compendium 2006 ($40). This blend is 52% Merlot, 19% Cabernet Sauvignon, 19% Cabernet Franc and 10% Petit Verdot. This wine was fermented and aged in small French oak barrels. It is structured deliberately to be more approachable in its youth than Oculus – in other words, the wine to drink while waiting for Oculus to age. It is a very appealing wine, juicy on the palate with flavours of blueberries and raspberries with an undertone of spice. The tannins are still firm enough to give this wine five to 10 years, even if it is drinking well now, if decanted. 89-91. Quatrain 2006 ($45). This is a blend of 41% Syrah, 32% Merlot, 14% Cabernet Franc, 13% Cabernet Sauvignon, fermented and aged in small French oak barrels for 15 months (only 45% of the barrels were new). Dark in colour, this is a full-bodied, satisfying red with spicy flavours of black cherry, blackberry, prunes and chocolate. The big ripe tannins and the chewy texture give this wine a long finish. 90. Perpetua Chardonnay 2007 ($35). No doubt it is a coincidence that this wine, now in its second vintage, shares the name of a Christian saint in Carthage whose father imprisoned her when she would not renounce her faith. That has nothing to do with the wine, although tasting this wine should convert those who have renounced Chardonnay in recent years. This is a fine quartet. The latest controversy over so-called Cellared in Canada wines seems to be heading toward a resolution that is in the interest of proponents of genuine Canadian wines. Tine will tell, given the wine industry’s long history of importing either fresh grapes or finished bulk wines. Let me provide some perspective. The recent controversy was triggered this summer by British wine writer Jancis Robinson, one of the world’s most influential wine writers. She was in the Okanagan for the first time in several years, tasted a selection of top British Columbia wines and was hosted at dinner by Vincor Canada, a leading bottler both of quality Canadian wines and cellared in Canada wines. In subsequent columns on her website and in The Financial Times, Robinson scolded the Canadian wine industry, not for the first time, for its Cellared in Canada wines. “I know I keep going on about this … but I think it is doing a disservice to real Canadian wine and its reputation abroad to continue this misleading practice,” she wrote. She argued that the big Canadian wineries “mislead” consumers by releasing wines made largely or entirely with blends of imported wines – and not making this clear on the labels. Her criticism was picked up by other media, including The Vancouver Sun in a scathing September 18 article suggesting consumers were being “deceived” by the Cellared in Canada wines. The Sun followed that up with several more articles while the CBC aired the issue nationally. Yesterday, the presidents of Vincor and Andrew Peller Ltd. met with the editorial board of The Sun and promised to resolve the issue with much more transparent labels. “There has never been any intention on any part of our companies to mislead consumers,” John Peller told The Sun. “We will take immediate steps to rectify and clarify the confusion because there never has been any intention on our parts to deceive.” Vincor president Eric Morham was quoted saying much the same thing. So Jancis Robinson has prevailed? We’ll see. Wine moves across borders all the time, ending up in international blends. Sometimes the labels are transparent, sometimes not. Austrian wine, for example, was blended anonymously into German wine prior to the 1985 Austrian wine scandal. Last year, I tasted some wretched international blends at a big German winery. The Canadian industry has a long history of importing grapes, concentrates or wine. In the 1920s, Ontario wineries imported grapes from New York because they were short of home-grown grapes. When winery expansion began in British Columbia after the war, a shortage of grapes led the government to sanction the use of imported grapes, provided that the wineries supported vineyard development here. André’s Wines, as Peller was then known, opened in 1961 with wines made from California fruit; at the same time, André’s planted the first vineyard in the Similkameen Valley. In the 1970s, regional development grants fostered substantial wineries in Quebec even though there were no vineyards at all. Some of those wineries imported Italian grapes while others imported concentrates. The wines were shocklingly mediocre and most of those wineries failed. 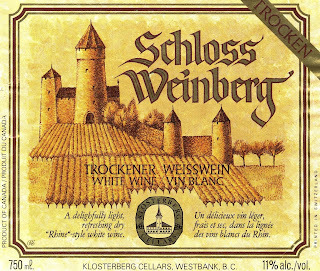 Canadian wineries in the 1970s faced the daunting challenge of making the European-style wines (that consumers here were demanding) with grapes that either were ill-suited for European wines or were not grown well enough to make good wines at all. In both Ontario and BC, the grape marketing boards could force wineries to buy nearly all the grapes, however poor they were. 1. They imported California or Washington grapes or bulk wines from the United States or elsewhere, releasing wines (sometimes blended with domestic wines) that better suited the changing consumer palate. 2. They created families of pseudo-labels to associate the domestic wines with the image and style of Europe. The labels pictured above are typical. Such labels were the complete antithesis of transparency. However, some were so successful – like Calona’s Schloss Laderheim – that they still sell. 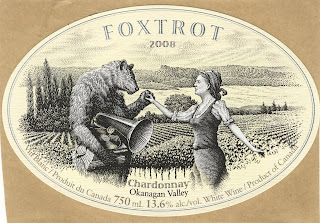 The pseudo-label wines undoubtedly kept Canadian wineries in business. Unlike today, Canadian wine could get no respect. In 1983, when I was completing a booked called The World of Canadian Wine, I chanced to meet Hugh Johnson in Vancouver. He was then the most influential British wine writer. I offered him a look at the galleys of the book and he was not remotely interested. I can’t say that I blamed him. 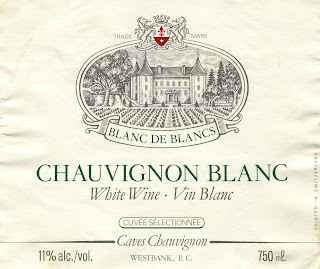 Canadian wines began to turn the corner in the late 1980s. Mediocre grape varieties were pulled out; vineyards were replanted with quality French vines. And the Vintners’ Quality Alliance program was launched in Ontario and BC. The VQA wines must be made with grapes grown in Canada. In the past decade, thanks to far better grape growing and winemaking, the VQA have achieved world class quality. For the first time in history, Canadian wines are taken seriously. 1. Generally, they can’t produce VQA wines cheaply enough to meet the consumer demand for $7-$8 wines. Bulk wines from, say, the vast vineyards of Argentina, are cheap and good enough. 2. The profits from the Cellared in Canada wines support the investment that the large commercial wineries have made in developing the vineyards and the wineries needed to make high-quality VQA wines. The irony is this: where mediocre Canadian wines once were clinging to the coat tails of bottled-in-Canada imports, today the inexpensive Cellared in Canada wines are hanging on to the coat tails of high-quality authentic Canadian wines. You see that in liquor stores where both wines are sold in the “Canadian” section. There are wines labelled Jackson-Triggs or Peller Estates in both the VQA aisles and the non-VQA aisles. Mission Hill has discontinued Caves Chauvignon or Schloss Weinberg but has created such labels as Sonora Ranch and Wild Horse Canyon for its Cellared in Canada offerings. Many consumers (even some liquor store employees) don’t know the difference. I would suggest many consumers don’t care either. They continue to buy Toscano Bianco, Hochtaler, Schloss Laderheim and Domaine D’Or, and no doubt enjoy the products. The fact is that the big wineries cannot afford to walk away from Cellared in Canada wines, however much those of us in the wine writing community would prefer a pure focus on Grown in Canada wines. Now the big wineries have promised to put more information on labels about the origin of the wines and get rid of the lookalike labels that have been less than honest. That is a positive step forward. Thank you, Jancis Robinson.